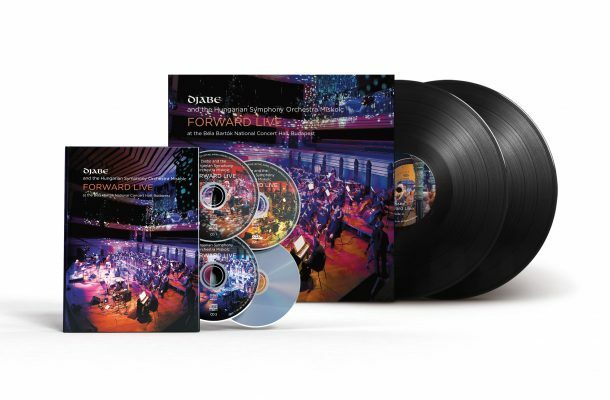 Djabe released Forward in 2014, an album made with the inclusion of the Hungarian Symphony Orchestra Miskolc. Both the audience and critics hailed this release as the paramount Djabe experience. The most outstanding about Forward are the compositions, born to feature Djabe and the symphonics as equal partners: two musical worlds complementing and completing each other. Many claim Forward is the best ever album released by the band. Compositions written by Tamás Barabás and Attila Égerházi, symphonic sections were done by Tamás Barabás and orchestrated by Zoltán Kovács. Album premiere was held at the Béla Bartók Concert Hall of Müpa Budapest, on 10th of November, 2015, with the complete album performed by the band and the HSOM, conducted by József Reményi. Stretching this premiere to a 2-hour length, Tamás Barabás re-imagined the piece Iceworld with symphonics and, further more, a medley was born from old Djabe songs with again, a symphonic touch. The studio album feature many guest musicians, with the two most important (Azerbaijani tar player Malik Mansurov and Hungarian tabla player Tibor Mótyán) also attended at the live performance. The concert is available in two release forms. The 64-page hardcover book features two CDs and two DVDs. The book provides an experience of rich illustrations walking through the story of the album and the concert, complete with multiple writings and critiques. The CDs feature the complete audio recording of the gig, the first DVD features the video recording (done with 24 cameras on site) and a short documentary, and the concert audio recording in 24bit/96kHz stereo PCM, and 24bit/96kHz DTS surround. The second DVD features the original Forward studio album, with the best available quality of 24bit/96kHz MLP stereo and surround audio tracks and DTS 5.1 and PCM 2.0 tracks, also. This DVD has extra material too, both audio and video. The film version of the concert at Müpa by Djabe and the HSOM clearly is the very best of all Djabe concert videos.